Mar 10, 2015 (CARTHAGE, NC) The County Board of Elections will resolve the status of 109 voters, tomorrow morning, at 10:00, in room #104 of the Rhyne Public Safety Center. The voters were all challenged by Pinehurst resident, Carol Wheeldon, after her research team discovered around 500 voters who did not live at the addresses listed on their registrations. More than half of the initial 109 voters have either been removed been or had their addresses updated as a result of the investigation triggered by this challenge process, according to BOE Director Glenda Clendenin. “Most of the voters we’ve contact have been very appreciative of this process,” she said. Her office attempted to make contact with all of the challenged voters, but some never responded to phone calls and to mail that was forwarded from their last known addresses. The preliminary hearing was held February 10 at the BOE main offices. 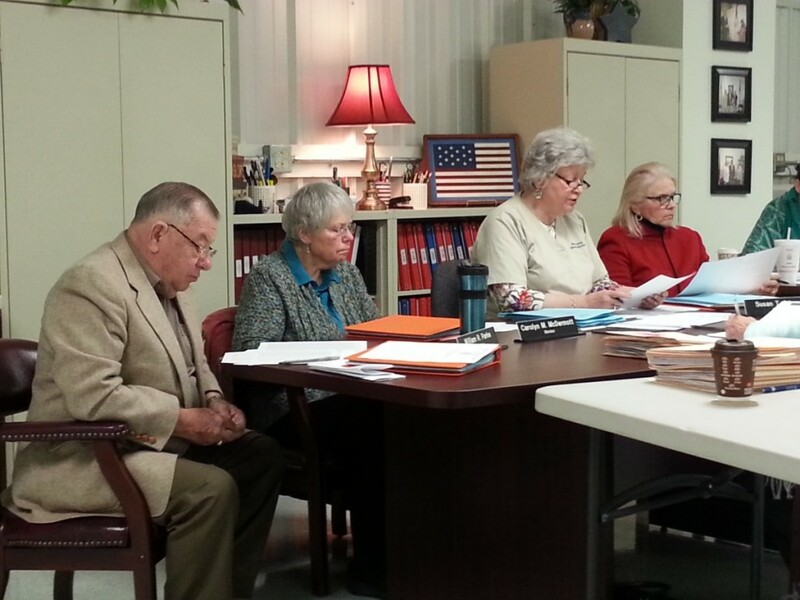 Moore County BOE members (L-R), Bill Parke, Carolyn McDermott, Glenda Clendenin (Director) Susan Adams (Board Chair) at the Feb 10 hearing.